The Heavy & Humid Body Constitution mainly originates from a weakness in the spleen. An imbalanced and weakened spleen can result in food and water not being effectively digested and absorbed. The undigested and non-absorbed food and water become “Phlegm”, (the Chinese Medicine term for metabolic waste), creating an inner “Heaviness”, whereas the damp and wet part of the undigested food creates an inner “Humidity”. The Phlegm is then stored in the body and eventually inundates the organs. Over weight, cardiovascular diseases, high blood sugar levels, hypertension and high cholesterol levels are common to individuals with a Heavy and Humid Body Constitution, as their diet is sometimes rich and high in sugar/salt. Less severe ailments include skin impurities, undesirable odor, excessive sweating, or inertia, that collectively impact the overall attractiveness and health of a person. To find out how to lead a healthy and balanced life if your body type is Heavy & Humid purchase our detailed 15 pages report. 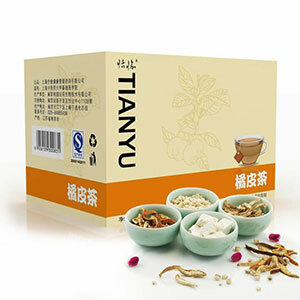 The Oriental Balance Chen-Pi tea contains a carefully selected combination of herbs that help to address the less severe symptoms of the Heavy & Humid Body Constitution. Prolonged usage will help to bring you back to balance and thus minimize or prevent the occurrence of more serious ailments by promoting the digestion and absorption of food and nutrients into the body.